How to Change Homepage on Google Chrome? Do you know what a Homepage is? A Homepage is a page, that automatically opens when you launch your browser on the screen or, the page you get when you click the Home button present on the ribbon of your browser. Sometimes browsers are already preloaded with default homepage which you may not want. So move on and change default homepage of your browser. You can keep on updating homepages of your browser according to your use. This article explains step by step procedure of setting a home page. So let us begin with How to Change Homepage on Google Chrome? Step 1: Open Google Chrome browser on your screen. 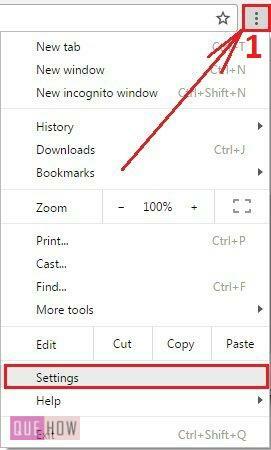 Click on the Customize and Control Google Chrome (1) button at the top right corner of your window. Among the options click on Settings. Step 2: A new Settings tab will get open. Under Appearance (1) section, you have a checkbox named Show Home button (2) mark that checkbox. You can observe that the Home button will start appearing in the ribbon above. Step 3: As you mark Show Home button checkbox, some text will appear below it i.e. New Tab page Change. Click on, Change, it is a hyperlink that will lead you to the next step. Step 4: A Homepage dialog box will get opened. Click on the radio button of Open this page: and type the URL of the website that you want to set as your homepage. After typing URL click on OK. Step 5: There is no save button to save the settings you have done. Just close the browser window and restart it again. You will observe that browser has now opened with the homepage that you have set. It is very easy and not even time consuming. So just not waste your time in typing the URL. Make the most used site as your Homepage and save your time. Thank you. Hope this content is useful. Keep reading. How to Change Start Pages in Google Chrome? How to view saved Passwords in Google Chrome? How to restore a previous Session in Google Chrome? How to Block a Website in Google Chrome? How to Sync Bookmark in Google Chrome? How to disable Autofill in Google Chrome? How to Export Bookmarks in Google Chrome? How to block and allow Pop-ups in Google Chrome? How to Change Start Pages in Google Chrome? How to view saved Passwords in Google Chrome? How to disable Autofill in Google Chrome? How to Export Bookmarks in Google Chrome? How to Sync Bookmark in Google Chrome?